Last year, I ran what turned out to be a very successful afternoon workshop on growing and foraging for herbs and wild flowers, and using herbs at home for treating a variety of common complaints. The workshop took place at Dromana House and Gardens, on the banks of the beautiful Blackwater River in Cappoquin, Co. Waterford. The event began with a talk about herbal medicine, which quite simply uses plants and plant extracts in the treatment and prevention of disease. People have been using plants to cure illness for thousands of years. In fact, herbal medicine and orthodox medicine share a common root: it was not until around 200 years ago that scientists first began to extract individual active constituents from plants in order to produce orthodox drugs. Most of the pharmaceutical drugs used today are still based on plant constituents that have been extracted or synthesised in a laboratory. For example, digitoxin from foxgloves is used to treat heart disease, morphine from the opium poppy is a powerful painkiller, and vinchristine from periwinkle is used in chemotherapy. Herbal medicine, however, still uses the plants themselves, which contain many constituents, ‘as nature intended’. The main active component of the plant is balanced by the other constituents, which support its action or reduce its side effects, and many herbs, which can be easily grown at home, or collected from the wild, can be used to make simple home remedies to treat a variety of common complaints. After the opening talk, we went for a walk around the beautiful gardens at Dromana House, stopping to talk about the medicinal properties of the various plants, including growing tips and advice on how to use different herbs to make simple home remedies. The formal herb garden at Dromana House is very new, but contains an amazing selection of different herbs with a wide variety of medicinal uses. 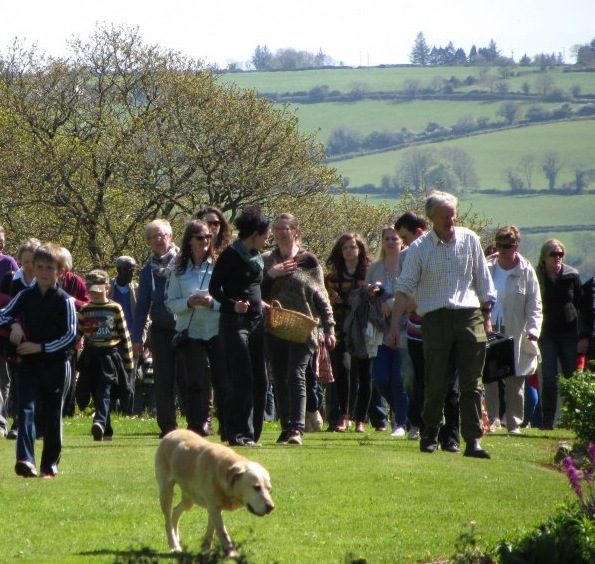 After spending time in the formal herb garden, we ventured across the lawn and through the woodland leading to the banks of the Blackwater river, where we talked about the medicinal uses of various wild flowers, plants and trees. We were blessed with a glorious sunny day for the event, and there was a very relaxed atmosphere with people asking questions and joining inn the conversation. After the walk we went inside the house for a demonstration of how to use some of the plants we had gathered to make simple home remedies, including herbal teas, syrups, infused oils and creams. Finally we were treated to cups of tea with delicious homemade herb scones and lavender shortbread. The event was very popular and we have therefore decided to run another workshop this year for anyone who would be interested in learning more about growing and foraging your own herbs and wild flowers. The next workshop will take place next Sunday, 4th May 2014 from 2-5pm at Dromana House. Admission is €10, and children under 12 are free. Tea and light refreshments are included. For further information or to book your place, please contact Dromana House on 024 96144.